Yesterday was definitely one of the most interesting days I've ever had on Twitter and it was all because of the #AskACurator global chat event between museum curators and the public. Organized by social media consultant to the arts @MarDixon, the chat provided unprecedented access to real museum curators. In a cacophony of tweets, the public asked all kinds of questions to these gate keepers of art. It's certainly not easy to answer any question in 140 characters or less, but 622 museums in 37 countries participated. I was able to ask a few questions that got answered but there were some #AskACurator tweets that didn't get answered. 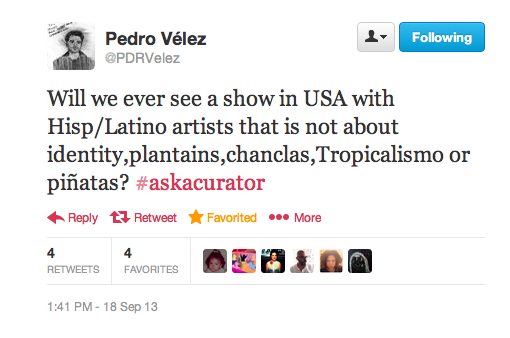 Here's a tweet by art critic Pedro Velez that the curators probably didn't know what to do with but was worthy of an answer no less. 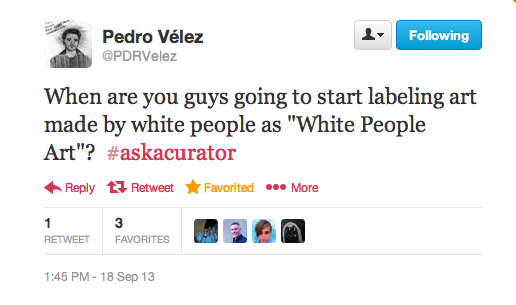 And another tweet by @PDRVelez that went unanswered... well I hope it at least sparked some ideas for future group shows! 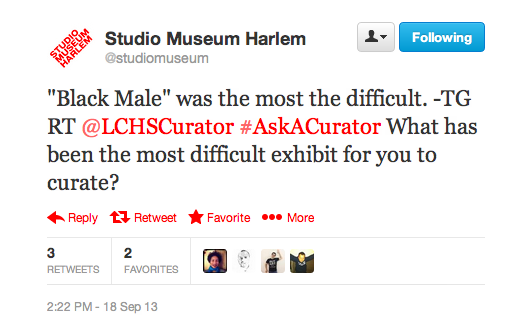 Studio Museum in Harlem's own director, Thelma Golden, responded to tweets today. Check out this video featuring an interview with Golden for her 1994 show "Black Male: Representations of Masculinity in Contemporary American Art" held at The Whitney Museum of American Art. @sfmoma with Curator of Photography Cory Keller who says that "word of mouth from other artists and colleagues" is the best way he discovers new photographers. @amhistorymuseum answered questions specific to their Asian Pacific American collections. @JFKLibrary tweeted a link to a letter written by gay rights activist Frank Kameny. @metmuseum curators tweeted about El Anatsui's sculptures and a recent Julie Mehretu acquisition. @ROMtoronto tweeted lots of pics showing their unique collections. As I write this tweets are still coming in but I am so looking forward to the next #AskACurator Twitter chat! There were quite a few photography curators available during this chat so if you use your 140 characters right, it's a great way for artists to reach out to curators.